Akio Toyoda's bow - but was it a sincere demonstration of apology? A bow is an important yet ubiquitous gesture in Japan and getting it right is essential. 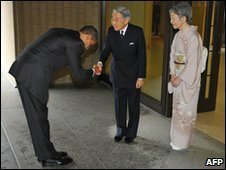 As US President Barack Obama discovered when he bowed and tried to shake hands simultaneously with Emperor Akihito, it is not easy, especially if you are so much taller. The US media, or at least the anti-Obama wing, launched a feeding frenzy of criticism about Obama blowing the bowing. Was he kowtowing? Was he breaching protocol? Oddly enough, in Japan, nobody took umbrage - or notice - and the Japanese media reported the story as one of those inscrutable aspects of America, a nation that looms large in Japan even if it is a baffling place where one man's gaffe is another's show of courtesy. Scroll forward to the recent display of bowing by Toyota president Akio Toyoda. At a hastily called press conference on 5 February he gave a slight, brief bow, one of those perfunctory, all-purpose bows that are habit-forming in Japan. This standard issue bow is what one does with neighbours you meet when tossing out the rubbish. 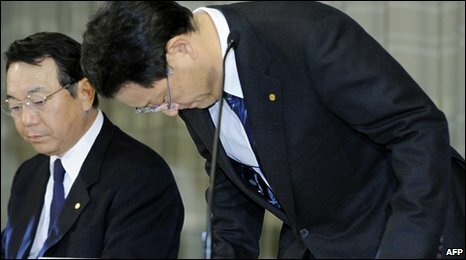 Given he had been missing in action for much of the previous two weeks while Toyota battled complaints about safety defects in its brakes and accelerators and the company's share value tumbled nearly 20%, it is safe to say Mr Toyoda's token bow and carefully calibrated apology failed to meet expectations. Somewhat surprisingly, the Japanese media took off the gloves, denouncing his gesture as too little too late. The deepest standing bow, head breaking the plane of the knees, is for more serious cases like when the maitre d' can't find your reservations or is apologising for the insect in your salad. Or put another way, the bowing of regret was too casual and flippant. Mr Toyoda was slammed for mishandling the crisis and made matters worse by underperforming the bow and sleepwalking through the news conference where he was supposed to allay anxieties. For connoisseurs of bowing, it is all about angle and duration, the deeper and longer the more deferential or humble, although sincerity is optional. The curt bow of the head is akin to a dismissal, like when one is turned away from a crowded club or a boss is letting you know the bonus you received is far more than you deserve. Briefly inclining the shoulders and quickly walking away is for misdemeanours like when your child has vomited in the video store. The repeated bow from the waist accompanied by wails of apology is reserved for cases where the mechanic crashed your car when taking it in for mandatory inspection but still insists on charging you $1,000. The nurse who just nicked you and drew blood while shaving "down there" during pre-op prep bows and drops to her knees in a chorus of soothing apologies while dabbing the wound. But one is sometimes surprised about where and when to expect bows - bullet train delays merit a deep bow from the conductor, head almost to level of knees, while suspension of the gondola service at the ski area is shrugged off as an unavoidable inconvenience. But bowing is usually just a gesture of recognition, one performed numerous times in a day almost unconsciously, even when being given change back at the cashier. Long-term foreign residents on home leave have to catch themselves as friends wonder about that unfortunate nervous tic. On 9 February Mr Toyoda nailed the entrance bow much better, a bit deeper and more sustained. But throughout the news conference, one aimed at blunting the rising tide of criticism in the US where congressional hearings were about to begin, he looked like a man who had just eaten something very nasty. His grimacing frown was a sight to behold, sending out an unmistakable sign Mr Toyoda wanted to be anywhere but in front of the media rabble, impertinently asking hostile and pointed questions. Akio Toyoda is a reclusive, publicity-shy man thrust by birth and circumstance into the world of showmanship that has become part of a CEO's job description. Steve Jobs has shown the world how to do it, but there is no inner huckster for Mr Toyoda to draw on. He comes from a Zen culture of quiet dignity and stoic perseverance, where actions speak louder than words. His serious demeanour conveyed a quiet resolve to restore his family's tarnished honour by doing whatever it takes to regain customer trust and restore Toyota's well-deserved reputation for quality. And he gave a very decent parting bow, one that conveyed sincerity and contrition to anyone paying attention. The weekend practice sessions and preparation paid off. Understandably, the scion of Toyota is not accustomed to the bow of humility since he is usually on the receiving end of such displays from those seeking to curry favour. When he took over last summer, he pointed out that the greatest challenge facing him was "big company disease". Apparently that means forgetting the art of apology. Suddenly confronted with adversity, Toyota initially reacted defensively, denying, minimising and shifting responsibility because in its heart-of-hearts the company believes this PR nightmare is a gross exaggeration and does not think it has erred or that the brake and accelerator problems are really defects. That is a big reason why Toyota has woefully mismanaged this crisis and why the bowing has been well below Olympic standards. Perhaps the best all-round performance in synchronised bowing was delivered by the presidents of several pharmaceutical companies who had sold tainted blood products to haemophiliacs, infecting many with HIV. After denying responsibility for more than a decade, incriminating documents came to light in 1994 showing market share and profits had trumped consumer safety. Meeting with the victims after negotiating a settlement, the executives all dropped to their knees and touched the floor with their noses, holding the pose for several seconds, an abject bow of contrition. Jeff Kingston is a professor of Asian Studies at Temple University's Tokyo campus.